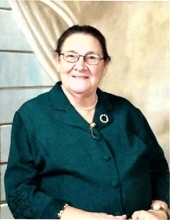 Katie Saylor, 86, of Manchester, KY, passed away Monday, March 25th, at her home. Katie was born in Manchester, KY on September 29, 1932, a daughter of the late Allie Fair (Eversole) and Jimmy Gibson. She was preceded in death by her husband, Orville Saylor. Katie is survived by three daughters: Ola Saylor of Topock, AZ, Frances Saylor and husband Jeff Hoover of Mt. Juliet, TN, and Brenda Saylor of Manchester; and by five sons: Henry Saylor and wife Robbin of Hamilton, OH, Lee Saylor and wife Nori of North Edwards, CA, Josh Saylor of Manchester, Larry Wayne and Diane Bowling Saylor of Manchester, and Jimmy Saylor of Manchester. Katie is also survived by three sisters: Kizzie Collins of Stamping Ground, KY, Rachel Hacker of Oneida, and Mary Caldwell of Manchester; and by two brothers: Clay Gibson of Manchester, and Ernest Gibson of Burning Springs. She is also survived by 22 grandchildren: Henry Jr. Saylor, Rosie Saylor, Charles “Petie” Saylor, Jack Roberts, Matthew Roberts, Joey Saylor, Greg Saylor, Trisha Saylor, Amanda Saylor, Julianna Montoya, Matthew Saylor, Jason Gross, Leslie Gross, Kevin Downey, Katlyn Saylor, Jonathan Saylor, Mesa Saylor, Leola Jacobs, Adam Jacobs, Allie Hoover, Jeremiah Hoover and Deronna Saylor-Moore; 16 great grandchildren: Summer Jarvis, Jessica Hicks, Regan Saylor-Minton, Shannon Saylor, Jessie Saylor, Trenton Saylor, Lorelei Gross, Stormie Gross, Eli Gross, Kaylee Roberts, Adiley Jacobs, Jason Bryan Gross, Gracie Roberts, Emma Saylor, Selena Curry, Sarah Root; and two great-great grandchildren: Alyssa Hicks and Braiden Hicks. In addition to her parents and husband, Katie was preceded in death by her daughter, Allie Fair Saylor, and the following brothers and sisters: Ola Ruth, Bertie Hollin, Huey Gibson, Frankie Gibson and Joe Gibson. Services will be held at 2:00 PM on Friday, March 29th at Britton Funeral Home in Manchester, KY, with James Wagers and George Roberts officiating. Burial will follow at the Herd Cemetery on Horse Creek. Visitation will be held 6:00 PM on Thursday, March 28th at Britton Funeral Home in Manchester, KY.
To send flowers or a remembrance gift to the family of Katie Saylor, please visit our Tribute Store. "Email Address" would like to share the life celebration of Katie Saylor. Click on the "link" to go to share a favorite memory or leave a condolence message for the family.